Seldom has the conference had a “good day” as a whole this season, but Saturday was an exception. 8 Atlantic 10 teams were in action, 5 of which were victorious. The 3 teams that came out on bottom (George Washington, Davidson, and Saint Louis) all put up impressive fights as definite underdogs. If you’re a fan of the league as a whole, there was really not too much to complain about on Saturday. Here are some thoughts. Credit Matt McCall for what he’s been able to do as of late. Following an embarrassing loss to Quinnipiac, the Minutemen turned around and almost beat South Carolina on the road; the close contest would spark a 3 game winning streak that’s highlighted by marquee wins over Providence and Georgia. While LuWane Pipkins and even Carl Pierre were the ones who stole the show against the Bulldogs, it was C.J. Anderson who I was particularly impressed with on Saturday afternoon. In the half court, the senior did an incredible job breaking down Georgia’s defense simply by making sharp cuts. You’ll see him drive quickly into the heart of the defense and kick it out to Chris Baldwin, an open shooter who’s now 37% from deep this year. 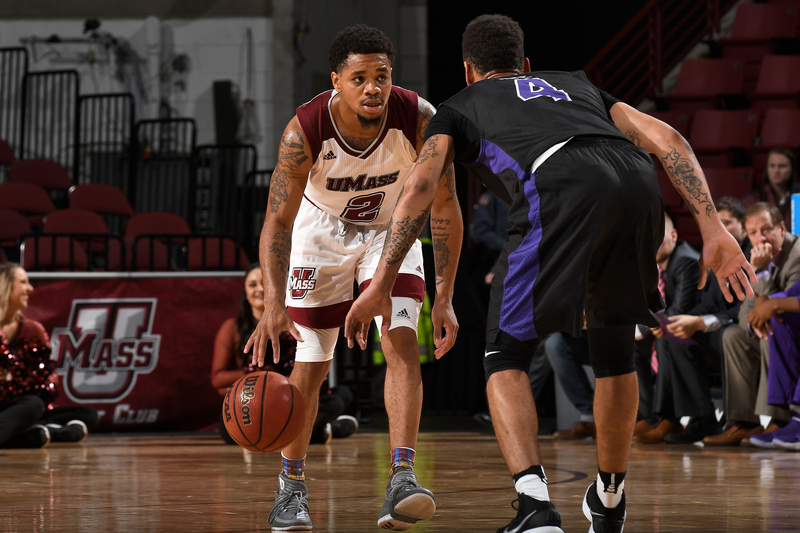 LuWane Pipkins is more of a pick-and-pop guard, but C.J. Anderson has the ability to set up his teammates with looks from behind the arc. In addition to his 10 points, the senior led the Minutemen with 7 assists against Georgia and was a big benefactor in Massachusetts’ 12 made threes. Not just that, but Anderson does a real nice job moving without the basketball. This cut in the second half in particular was one of the best plays of the game. A heads up move against a sleeping defense is the way you beat a favored opponent on your own court. The senior caught his defender sleeping and made him pay. Finally, I really though Rashaan Holloway played his game better than he has all season. The junior has touch inside the paint, but I think he can get out of line when he tries to force shots. Holloway hadn’t been his normal self earlier this season, averaging just 6 points per game against Niagara, Western Carolina, and Minnesota. However, through his last 2 contests, the big fella has 23 total points on 10/13 shooting. Not to mention, he’s found his touch like no other and is beginning to prove himself the post threat we thought him to be all along. I think Holloway looks so calm in the post and played with a kind of swagger I hadn’t seen this year. I want him to be a comfortable player, because when he takes his time and establishes his rhythm in the post, he has impeccable touch for a big man. I don’t know what exactly happened, but Matt McCall has this team playing so loose. At no point did the Minutemen look rushed or panicked; they got off to a hot start and handled their business down the stretch. Even when Georgia made a run in the 2nd half, this Massachusetts team remained calm and finished the job. Props to the coach who has his team looking like a veteran bunch in December. It’s pretty simple. Dayton almost blew this game because it did not feed the post like it should have. In the overtime session, Cunningham attempted just 1 of 5 Dayton field goals. The junior ended up with 29 points and 18 rebounds and still found a way to get involved even when the Flyers hoisted threes. Particularly, Cunningham crashed the boards on the offensive end and cleaned up his teammates’ misses. I haven’t been very impressed with Anthony Grant in the final minutes of games this year, and hence, the Flyers are just 2-4 in games decided by less than 10 points. I’m not discrediting this win, but I’m saying it could have very easily gone the other way if Georgia State had made a few shots (the Panthers had a put back on a missed free throw that basically went around the entire cylinder and out). On this possession in the extra session, John Crosby fails to get the ball into the post, isn’t quick enough off the dribble, and instead denies a ball screen set by Cunningham. Dayton’s point guard drives the lane, giving the Georgia St. defender plenty of time to recover and lock down Cunningham. This leads to an ill-advised 2 point attempt through 2 defenders when Cunningham has been your rock in the post all night. Paint touches were key for Hasahn French and the Billikens in their second half comeback against Murray St. last week. The Billikens went looking inside for French again when taking on Oregon St. in Portland; however, towards the end of the game, SLU started settling for long range shots which is not its game. Here’s an instance against Murray St. where French was able to back down his defender and kick out to the open shooter on the perimeter. By establishing an inside game first, the Billikens can utilize their size inside to draw attention and therefore get better looks from deep. Saint Louis only made 4 of 15 three point attempts on Saturday night against Oregon St., and even so, I’d rather this team try to play inside-out for three balls. For example, I can’t discredit SLU or Goodwin on this made three pointer, but this is a low-percentage shot for the freshman. While he shot better against Oregon St. than he has this season, I’m still not in love with Saint Louis (one of the worst 3 point shooting teams in the nation) not looking inside first. Hasahn French is able to bully his way through a lot of collegiate defenders, and we’ve seen that all season. However, his tendency to get in foul trouble has hurt this Saint Louis team. The Billikens are at their best when they work the ball in the post and play through their freshman, believe it or not. Whether he takes it to the rack and raws contact or finds an open cutter or shooter, SLU is going to get better looks all around. Now, the Billikens just have to focus on making their free throws.